jello mold, originally uploaded by not a hipster. What are you making for work at 3:30am? Wait, how did my husband end up with me making him cinnamon rolls and cupcakes to take to work, and I get stuck with a Jello mold that I wouldn’t even get to eat if I wanted to??? On the upside, we had a meeting during the dinner break to discuss emergency procedures. Thank goodness I know what to do if we have to call an ambulance! 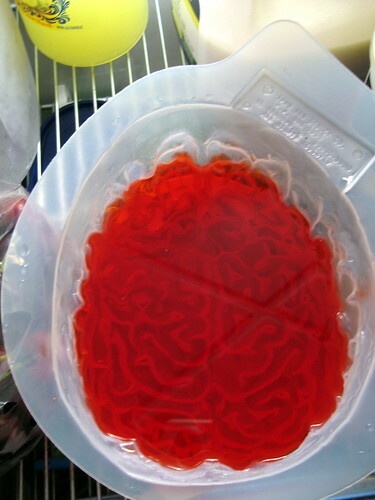 Maybe you could make the next ‘jello’ mold a non-gelatin creation. Perhaps something in the mousse variety? Maybe a lemon -white chocholate? if such a thing exists.. or a peach flavor? for the nice fake brain color? Just for you, Katya, I looked for non-gelatin molded foods, but I am not having much luck. There is an actual “recipe” for the right color which is watermelon Jello and a can of evaporated milk. The mold is a loaner, though, and will have to go home after the show closes. Of course, the husband has had his interest piqued and is considering buying one for use at Halloween. Shocking. Next post: do you have a soul?